Posted Sept. 1, 2014, 8:21 p.m.
A week ago I was just finishing up the most ambitious game jam project I’ve done to date. Compared to projects I’ve worked on in the past, Voyage of the Magpie is less immediately rewarding - there’s no jumping, no shooting, and no skill points to spend. There are, on the other hand, coins to pick up, mazes to run, tickets to manage, and click-heavy mini-games. 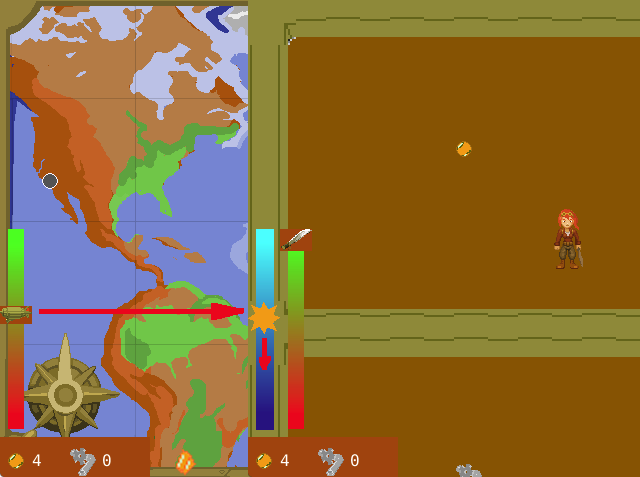 The goal of the project was to create a set of three smaller games that were somehow connected to meet the theme requirement for “connected worlds.” As a secondary (but more obvious) nod to the theme, the game involves navigating a network of interconnected locations all over the world to find lost treasure. 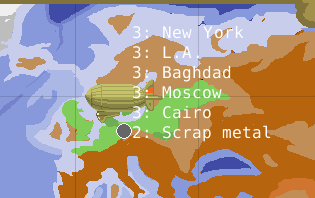 In the over world section of the game, the player flies their zeppelin from location to location by using tickets associated with those destinations. The tickets are consumed, but more can be purchased in cities or found in mazes. Tickets sort of represent leads on where treasure might be. At non-city locations the player will run a procedurally generated maze in either a temple or jungle setting. Gold, scrap metal, and tickets are gathered in the maze, which must be navigated before the sun sets. The more damaged your zeppelin, the less time you have to run the maze. Barriers in the maze are chopped through with the heroine’s machete, which dulls with use. 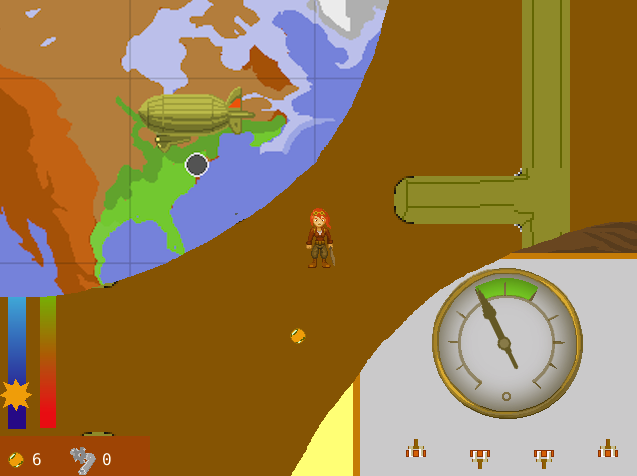 In the third section of the game, the player attempts to repair their zeppelin and machete before setting out again to explore the unknown. The only way to succeed at the game is to be good at planning your moves, navigating mazes, and rapidly completing tasks. These different jobs are supposed to feel like different "worlds" to the player. Conceptually, the game was way too ambitious for a 72-hour jam. It was terrifying to work on because you can’t really get a feel for what the final game experience will be like while building THREE GAMES at once. It started to come together at the end of Sunday, but just barely. Though the end product was playable, there was no time to implement a tutorial. Given the complex inter-connection of the game phases, a tutorial was sorely needed - or at least better conveyance of what the connections were so the player could discover it themselves. As a brief summary, here’s how the player was intended to see the connection between zeppelin condition and time in the maze: on the over world a zeppelin condition bar is on the far left. When entering a maze the bar on the far left is at roughly the same location but is now a sun icon. Transference of zeppelin status to sun status is unclear. Thematically, damaged zeppelin is slower, leaving less time for exploration. Hopefully they would also see their machete condition lowering as they chopped through the jungle and would notice it improving during the repair phase. 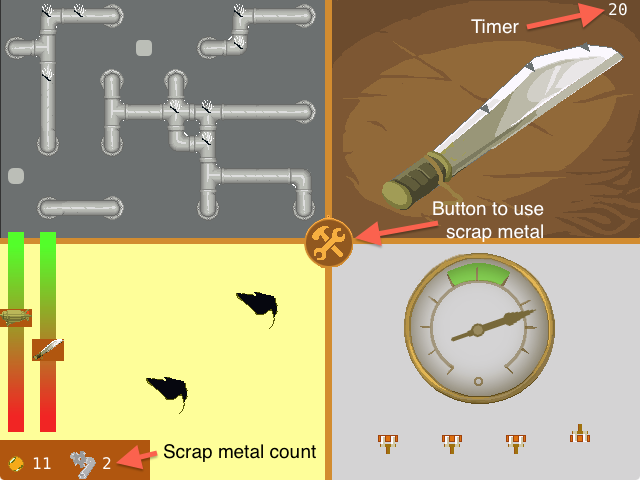 The biggest oversight was not adequately showing the player how to use scrap metal. The repair screen features a prominent central symbol that the player is meant to click to extend the timer. Unfortunately, the button is a baked-in image I was unable to give an effect when hovering over. Also, the timer and metal display are so small and far away from the button that even if the player were to press it they would likely not notice what it did. Some minor cuts were item pickup sound effects and walking animations. More seriously lacking was a statement of the overall goal - find the Golden Magpie in the city of El Dorado. Without knowing when the game would end, players got confused. That combined with an ear-piercing sound whenever you try to sharpen your machete made for an unintentionally grating experience. The least amount of work went into the maze-running section of the game. I shied away from working on it even though I knew that everyone would see that as the “main” game mostly because I didn’t know how I’d be trying to populate those mazes. In the end it was too big of a problem to tackle last and I ended up with the system you see - one gold piece per room, with either metal or a ticket at each dead end. I didn’t put an explicit end to the maze since I wanted the run to be timed. This was also a problem of conveyance, since the player could explore a really small maze and have to sit and do nothing for about 30 seconds. Pressing Enter will skip to the repair phase when the player is done exploring, but with no visual button I had to try to tell the player in the comments. I intended to auto-transition the scene by counting loot left in the maze, but abandoned this idea due to time constraints. While working on disparate parts of the game in parallel was scary since the fun couldn’t be seen until much later, it did allow for me to squeeze as much productivity out of myself as possible. Once I was sick of working on one thing I could switch attention to something entirely different, which was nice. Also, despite the lack of tutorial I’m fairly happy with the systems that emerged. They play off each other in an interesting way, encouraging the player to be close to larger mazes to maximize the amount of time they have to explore them, and to plan their ticket usage. I’m also happy that I was able to get a shop system implemented. It’s cumbersome to try to buy multiple copies of the same item, but pulling off click-toggled menus wasn’t easy to begin with. After finishing a jam with a lot left to do, I like to go ahead and make improvements in a version with “Super” at the start if its name. I’ve tried to address many of the conveyance problems stated above in Super Voyage of the Magpie, as well as recording some sound effects for item pickup. I’ve also color-coded the locations by tier, so that the player knows how close they’re getting to the end. Higher tiers provide better tickets, with El Dorado as a possible drop on the top tier. From lowest to highest, the tiers are white, blue, and purple, with El Dorado a golden/orange color. After checking out the LD30 submission I hope you’ll check out the improved version too!